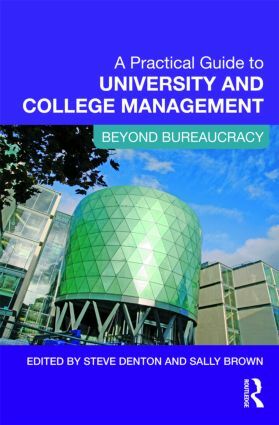 Written for Higher Education managers and administrators, A Practical Guide to University and College Management is a highly accessible text that offers practical guidance on how to manage the day-to-day life of universities. The authors take a proactive approach and offer a range of good practice examples and solutions, designed to resolve the dilemmas that arise in today’s rapidly changing higher education environment. A Practical Guide to College and University Management will be of interest to Higher Education managers, administrators, and anyone looking for a pragmatic "how to" navigational guide that informs the working life of a university, from attracting students through to graduation. It offers managers and administrators essential training and support required to promote highly successful and efficient Higher Education Institutions, and is essential reading for anyone who works in university administration or aspires to do so. Sally Brown is Pro-Vice-Chancellor for Assessment, Learning and Teaching at Leeds Metropolitan University. She has published widely on innovations in teaching, learning and particularly assessment. Steve Denton is Pro-Vice-Chancellor and Registrar and Secretary at Leeds Metropolitan University bringing together University-wide student administrative and support services, including governance and legal matters, the academic registry, planning, student services, communication and marketing and widening access and participation.